A beetle is winning the battle against the hemlock woolly adelgid at Nay Aug Gorge. 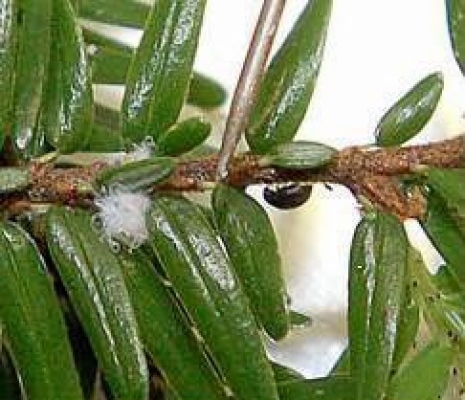 Almost 20 years after the woolly adelgid arrived at Nay Aug Park and started threatening the hemlocks in and around the gorge, officials believe they’ve finally gained the upper hand against the invasive, tree-killing pest, thanks in large part to a predatory beetle called S. tsugae. Since it started working with Santoli in 2011, Tree-Savers, a private company with offices in Waymart that specializes in saving endangered hemlocks, has released about 10,000 S. tsugae beetles at Nay Aug as part of an effort to eradicate the woolly adelgid and restore the park’s weakened hemlocks to health. Like the woolly adelgid, the beetle — its full scientific name is Sasajiscymnus tsugae — is native to Japan. It is the woolly adelgid’s natural enemy, feeding on the tiny insect’s eggs.